We look forward to being your website design company and working with you on something awesome. Visit iLocal, Inc. today at 92 Lenora St Seattle, WA 98121. We would love to discuss your project over a cup of coffee. The first step towards effective Seattle web design in Seattle is to attain a detailed architecture of your business. Once we determine what you are aiming for, we design a website that can make a huge difference in your company’s development. From concept to completion, we strive to accompany clean, striking website design features with concentrated purpose. Our web designer has experience in the technology, retail, plumbing and landscaping industries to name a few. Our experience and expertise means your website design will be an insightful, customized representation of your unique business, as well as a powerful marketing tool. 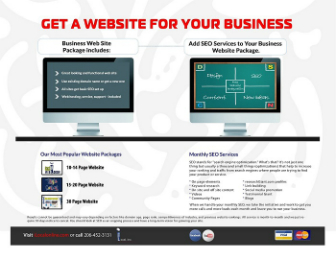 Providing a premium service, without the premium price tag, we are your go-to web designer in Seattle. Whether you are looking for a one page website or an online shop to make your products available around the world, our web designer can help. No matter the size or scope of your project, our web designer can get you going. We pride ourselves on prompt and courteous customer service. Our attention to detail is unmatched in this industry. Next time you have a website design need in Seattle, do not hesitate to visit us or call our office at 206-790-1999.